Hi! My name is Whiskey , which is short for "Wisconsin", which was my name at the Sacramento SPCA. You see, over 50 of us bunnies were confiscated from a breeder who hadn't given us proper care. At the Sacramento shelter we were all named after states and I got "Wisconsin." I have to admit that my new name, "Whiskey", at SaveABunny just sounds like a whole lot more fun and fits me because I am a fun guy! I love to do binkies and race around. You'd never know by watching me that I needed to have one of my eyes removed. When I arrived at The Sacramento SPCA from the breeder, my left eye was very damaged because an injury had gone untreated for too long. My eye was removed and now I am doing GREAT. It doesn't bother me at all to have one eye and hopefully you won't care either. I act and feel just like a regular bunny! 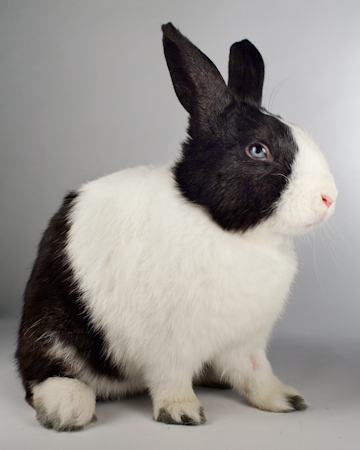 I am a sweet and active little neutered guy and I am ready to find my forever home. Please meet me soon!